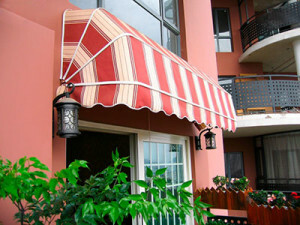 The right awning can go a long way for your property. Did you know there are awnings for windows, doors, porches, and patios? And for each one of these, there are many different designs. How do you know which one to choose? We’re here to help you through the process of choosing an awning that will make your property look good and save you money. The first step for any sort of commercial or home improvement project is to establish how much money you can spend. The size and material an awning is made of effect the price. If you decide to go with an automatically retracting awning, that will up the price as well. When shopping around, remember to talk to installers and factor in the price it will cost to install your awning! While you are shopping around, you also want to keep in mind the purpose for your purchase. Are you a business owner who wants an awning for customers to stand under? A large, protruding awning like a canopy or cabana style awning might be right. Do you want an awning that draws attention to your business? A sign box or a backlit awning might do the trick. Or are you a homeowner who wants to give your patio more shade and appeal? A retractable patio awning would be perfect. Depending on where you live, there may be certain zoning restrictions that do not allow businesses to have awnings. Check up with your local zoning officer before you make your final purchase. If there are restrictions, you may be able to obtain a permit from the Landmarks Preservation Commission (LPC) before you install your storefront awning. Of course, the best way to select the right awning for your home or business is to consult a professional. Someone who works with awnings will be able to look at your business and your budget and help you to choose the right awning that will complement your storefront and still be within your budget. Not only do professionals have experience working with the different materials an awning is made of, they also have experience outfitting many other businesses with the right awnings. A professional is a great resource of knowledge to help you choose an awning that is the right color, size, shape, and made of the right material.